Tabby accommodates Julius while one of her kittens looks on. Ragdolls are invariably white-furred, blue-eyed amiable cats -- like Tabby in the photo above. 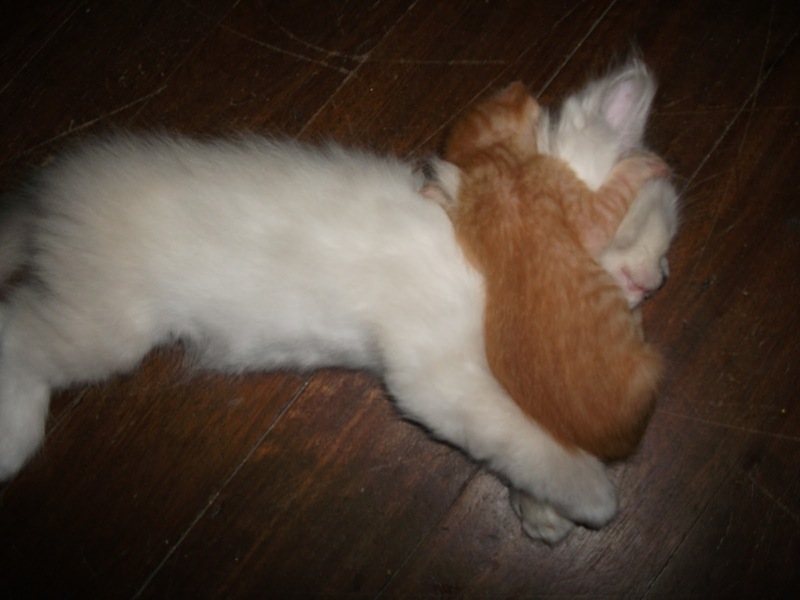 An orange stray is suckling hungrily, minutes after the kitten was picked up in a street corner. Tabby is the only mother cat of any breed in our home who is willing to succor any kitten in distress. And this is not the first time she has saved a kitten thrown to die, either by hunger, exposure to the elements, or to be squashed under the wheel of a passing car. People can be cruel if they are ignorant. I like animals more than people. This is not the first time Tabby has succored and saved other cat's child. 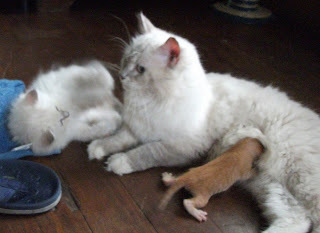 I remember April 2009, when Eric, a friend, brought a baby Ragdoll to us because the kit's mother could not produce milk. Eric came to us, hoping to find a way to save the feeble kitten, which was already weak from starvation. What a lovely story. I've been a cat lover all my life and am very touched by the compassion shown by kits, cats, and your family.